Trusted by elite military personnel, upgraded to serve all CCW permit holders. Sig Sauer’s M11-A1 is a civilian version of the U.S. military’s M11, complete with a Nitron-finished slide and corrosion-resistant parts. A U.S. Air Force Office of Special Investigations (OSI) agent trains with his 9mm M11 pistol after transitioning from his M4 Carbine. To prepare for her role in the movie Eagle Eye as an OSI agent, actress Rosario Dawson trained with Air Force OSI personnel and learned to use their issued M11 pistols. When the Beretta M9 was adopted in 1985, it was intended to replace a wide range of pistols and revolvers used by the U.S. armed forces. 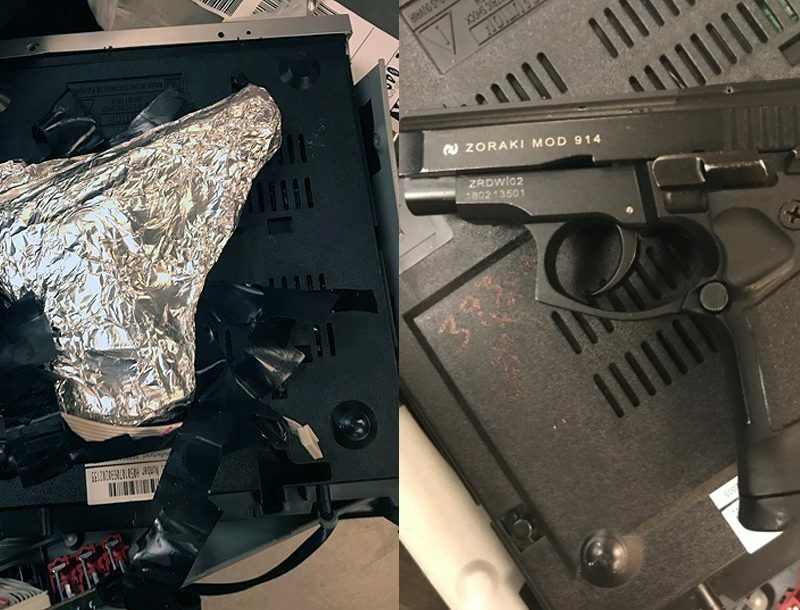 It did a good job of it, too, except that there remained a need for a more compact pistol to be carried by investigators from the Army CID, Navy NCIS and Air Force OSI, as well as some pilots and intelligence officers. Previously, most investigators had been armed with snub-nosed Colt or Smith & Wesson revolvers. A replacement would need to be in the now-standard 9x19mm NATO chambering and be more readily concealed than the M9. 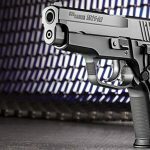 At least some consideration was given to adopting a more compact version of the Beretta 92 upon which the M9 is based, but instead the Sig Sauer P228 was adopted as the M11. Although the M9 and M11 are considered the two standard U.S. military pistols, they are not the only ones that have been in service over the last two decades. 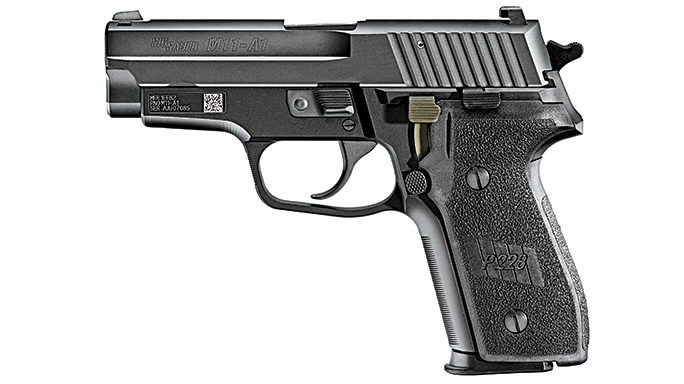 U.S. Navy SEALs have used the P226 Navy model and more recently the MK25 version of the P226. 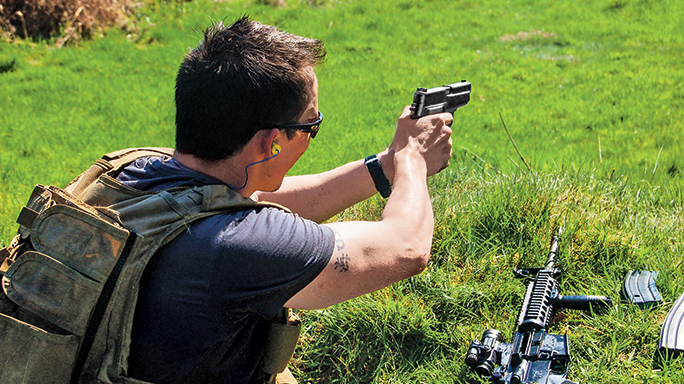 The SEALs and other special operations units have also used the HK MK23 Mod 0 “Offensive” handgun. 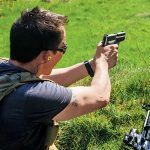 The MK23 retains the .45 ACP chambering of the Colt 1911, as do some 1911-type pistols adopted for the U.S. Marine Corps Special Operations Command (MARSOC) and Marine Expeditionary Unit Special Operations Capable (MEUSOC) personnel. Currently, Colt is producing the M45 CQBP (Close Quarter Battle Pistol) for Marine special operators. Special Forces operators have used an array of weapons, including Glock pistols. That’s some history, but let’s get back to the M11. Investigators, military intelligence personnel and pilots all have a sound reason for needing a more compact pistol than the M9; hence, some aircrew are issued the M11. Aircrew are especially weight conscious, since they are limited to what they can carry on a survival vest. Since an M11 with one loaded magazines weighs 28.8 ounces while an M9 with one loaded magazine weighs 41.6 ounces, there is a real advantage for aircrew. Still, some aircrew are issued the M9 rather than the M11. There also seems to be a certain status in being issued an M11. My military contacts tell me that some higher-ranking officers want an M11. Some female MPs with small hands and some female officers also seem to be authorized the M11 instead of the M9. SEALs and other special operators also use the M11 sometimes when they want a more concealable pistol. 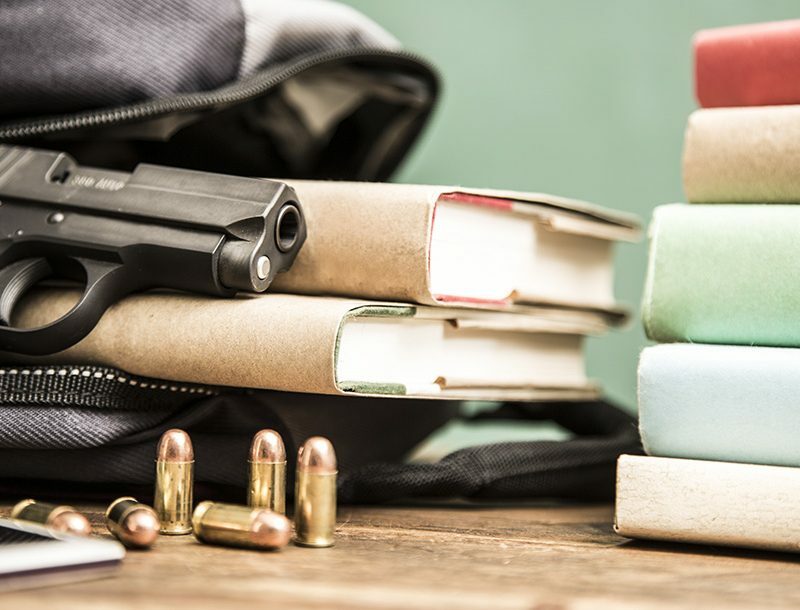 As of March 2003, various military investigative agencies had 5,317 in their armories, with at least some possibly being Sig Sauer P228s acquired before the deliveries of the M11 began. Since the NCIS is a civilian investigative agency unlike the CID and OSI, they are not as wedded to military-issue weapons. 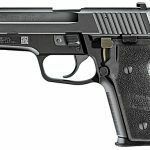 As a result, in 2008 Sig Sauer announced that the NCIS would be acquiring .40-caliber P229s and P239s to replace their M11s. The U.S. Coast Guard also uses .40 P229s. Contacts tell me that at least some units have ordered holsters for the M11 from various makers. However, the standard holster appears to be the GI M14 holster (NSN: 1095-01-338-4770). This is a forward-canted concealment holster with a retention snap. Flight crew survival vests have a built-in holster that will take an M9 or an M11. Generally, though, U.S. pilots are only issued a sidearm when flying in or near a combat zone. The M11 is loaded with the same M882 ball ammo with 124-grain bullets as the M9. Although you will find differing sources on specifications for the M882 round, normally it is considered to be loaded at +P pressures and provides muzzle velocities between 1,150 and 1,200 fps. Now Sig Sauer offers the M11-A1, a civilian version of the military’s M11. In simple terms the M11-A1 is an improved version of the original GI M11 that theoretically meets the basic “Technical Data Package” for the M11; however, I understand that as this is written M11-A1s are not being delivered to the armed forces. For the civilian shooter, though, the M11-A1 offers a chance to own a pistol that shares many features with the military-issued M11. There are a lot of features to like on the M11-A1. 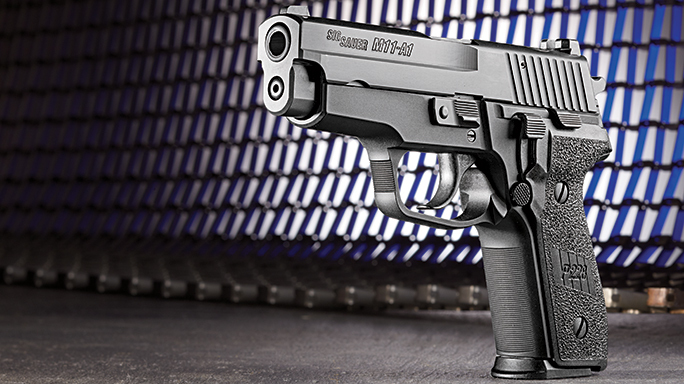 For example, it has corrosion-resistant internal parts, as do the pistols Sig makes for the U.S. Navy SEALs. The slide also has Sig’s Nitron finish, which I have found holds up quite well on the P226 I have carried quite a bit. As I understand it, Nitron is similar to what is known as a diamond-like carbon (DLC) finish. This is applied through PVD (Physical Vapor Disposition) and/or PA-CVD (Plasma Assisted Chemcial Vapor Dispostion), a process that increases wear resistance. The frame is hardcoat anodized. Another feature is the Short Reset Trigger, which makes it easier to engage multiple targets quickly. 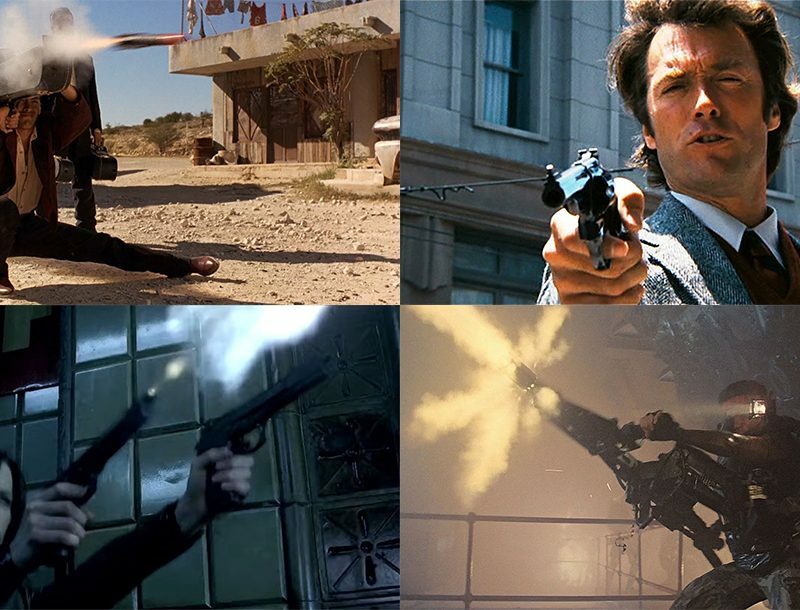 I use the Double Action Kellerman (DAK) trigger system on a lot of my Sig Sauer pistols, but I have also used the conventional double-action/single-action (DA/SA) trigger system for years, so I don’t mind that the M11-A1 uses this system, though it does make for a significant difference in the first-round DA pull and SA pull for subsequent rounds. I also like the SIGLITE night sights, as I use night sights on most of my pistols and am used to acquiring my targets in low light. The one problem with night sights in general, including the SIGLITEs, is that if they are off in elevation, it is necessary to track down the proper front sight post, which can be mastered with practice. I usually try to adjust by trying different loads until I find one that shoots to the point of impact. An interesting feature present on the military M11s and retained on the M11-A1 is the military-standard unique identification (UID) label on the pistol’s frame. It carries the manufacturer’s code, weapon identification and serial number. Since I don’t scan my weapons in and out of my armory, I find it an interesting cosmetic feature that gives the pistol more of a GI aura rather than a practical feature. The M11-A1 has a lanyard ring. This is always a useful feature on a military pistol and would be especially so on a pistol used by aircrew or naval personnel, where retention could be an issue. More recently, the U.S. armed forces have been acquiring the M9A1, which has an accessory rail. The M11 does not have an accessory rail, nor does the M11-A1. This makes sense, as the M11 is intended as a concealment pistol rather than a “tactical” pistol. One thing that should be borne in mind when evaluating the M11 pistol is that members of the OSI and CID have the dignitary protection mission with generals and Department of Defense officials. The M11 offers a good compromise between compactness, magazine capacity and performance. Just as a side note, other federal agents with protective missions, such as the Department of State Security (DSS) and Secret Service, carry similar Sig Sauer pistols, though Secret Service P229s are chambered in .357 SIG. I’ve taken the M11-A1 to the range a couple of times now. I used mostly GI overrun 124-grain Winchester and Federal ammo, but also fired some CorBon rounds for groups because I normally find it especially accurate. 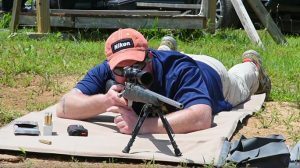 At 25 yards, using CorBon 90-grain JHP loads, the M11-A1 shot a 49 out of 50 on a bullseye target with a group around 2 inches. I’ve now taken the M11-A1 to the range twice and put 200 rounds of 124-grain NATO-spec ammo and 50 rounds of CorBon 90-grain JHP ammo through it. Next session I want to try the M11-A1 with CorBon 115- and 125-grain JHPs and Black Hills 115-grain JHPs. Overall, it has performed well. As with every Sig Sauer pistol I can remember testing, its reliability has been excellent—100 percent so far without any cleaning. The DA trigger pull is a bit heavy—10 pounds by factory specs—but it is smooth. According to the factory, the SA pull weight on the M11-A1 is 4.4 pounds, which allows for good accuracy downrange. I’m a big fan of the entire Sig Sauer line of P220-based pistols, and the M11-A1 is no exception. And it allows civilian shooters to own a pistol close to the military’s M11. It’s a good, interesting, combat-ready pistol. For more information on the M11-A1, visit sigsauer.com or call 603-610-3000.